Beware. If you buy a car on an outstanding loan, the car is not the vendor’s to sell and the lender can take it back. CV wrote to Honest John on 30th June complaining that a car he had bought via Gumtree still had a debt of £4,482 attached to it by a finance company. The vendor had left the country and the finance company was threatening to legally repossess the car if the debt was not paid off. CV thought that buying the car in ‘good faith’ meant he had clear title. 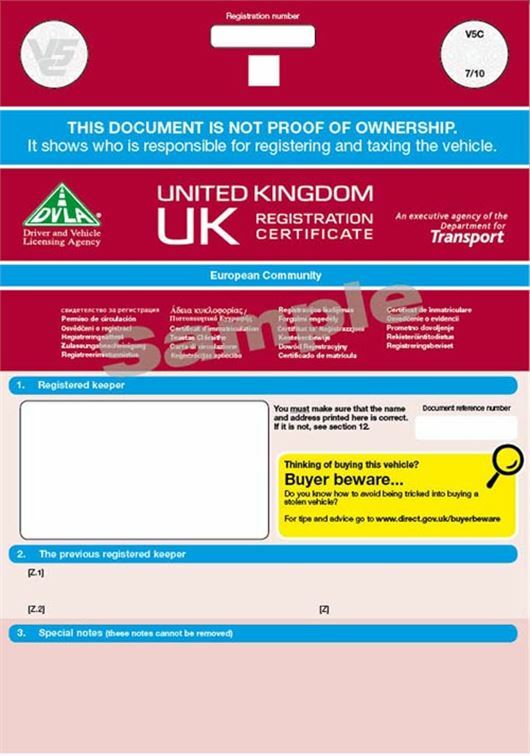 This is why before buying a used car privately it is vital to check the provenance of the car with a company such as MyCarCheck.com. There are two reasons why a vendor who is named on the V5C ‘logbook’ may not have clear title to the car. One is that it has been bought on finance and he has not paid this off. Never every buy a car with an outstanding loan except by prior written agreement with the finance company. The second is that the vendor has mortgaged his car with a ‘logbook loan’ company. Here, the car owner borrows money using his car as collateral, giving the V5C ‘logbook’ to the lender as security. So never, ever buy a car from a private vendor or home based trader if the V5C ‘logbook’ is not readily available. Unfortunately, there is nothing to stop a car owner who mortgages his car in this way from obtaining a second ‘duplicate’ V5C ‘logbook’ from the DVLA. These can sometimes be spotted if the print-run of the V5C is much later than the date of last change of keeper. But usually, there is no indication that the keeper has sold his title to the car, and the ‘logbook loan’ company can repossess the car as soon as it discovers from DVLA records of ‘change of keeper’ that it has been sold. Most ‘logbook loans’ are now registered and can be checked. But, until the law is changed, some ‘logbook lenders’ do not register the loans. And though MyCarCheck.com uses up-to-the-minute data from the Police (NPIA previously known as the Police National Computer or PNC) the Driver and Vehicle Licensing Agency (DVLA), the Association of British Insurers (ABI) and major finance houses including Lloyds TSB and Santander, it cannot 100% guarantee to alert a buyer to a ‘logbook loan’. MyCarCheck.com is seeing year-on-year rises in the number of cars being offered for sale with outstanding finance. Logbook loans are only a small part of this. Checking a vehicle is free of debt is one of the main reasons to use a provider such as MyCarCheck.com, a full member of the Motor Asset Registration Service (MARS), rather than a small time history checking operation that does not have the resources to pay for these vital data sets. Other major vehicle provenance checking specialists are HPI and Experian. What if the unscrupulous crook has already applied for the duplicate log book and gives this to the logbook loan company? The car can be sold within minutes of the loan taken place leaving the unsuspecting buyer high and dry. Buying from a private seller has always been risky, this takes it to a new level. You can guarantee that this will escalate very quickly! Unfortunately I think we have just witnessed the beginning of the end for buying a car privately, unless you can afford to take the risk. Why can't they introduce title documents like in the US. Here we have a registration document like the V5 that shows who the keeper is. We also have a separate title document that shows who the owner is. When you buy a car on credit you don't get the Title until it's paid off. Seems to work pretty well.